New rules allowing Georgian citizens to travel to the Schengen Area without a visa will come into full effect today. As Max Fras writes, EU visa liberalisation has been presented by the Georgian government as a major success story, but drawing on the experience of Albania, he presents four lessons that the country’s politicians should keep in mind now the new system is in place. Georgian governments frequently refer to the experience of Central and Eastern European EU member states as a source of guidance in the EU integration process. But perhaps more useful, if less welcome, comparisons could be drawn with the experience of a country a little closer to home, in the Western Balkans. As Georgia celebrates the successful conclusion of its journey towards visa free travel to the EU, there are important, if unexpected, parallels with the uneasy journey Albania embarked upon a few years earlier. This should be of concern to Georgian policymakers. But judging by the last two years, it seems that the Georgian government is at risk of repeating the Albanian experience’s worst moments, which could easily be avoided. There are four lessons in particular that it would be worth learning. Achieving Schengen visa-free access was a long process for Albania. It dominated the 2009 election campaign, when the newly re-elected PM Sali Berisha vowed to conclude an EU visa deal within a year in office with little factual evidence to support this pledge. Despite the optimism of the Albanian government, the EU did not include Albania in the first round of Western Balkan visa liberalisation in July 2009, officially citing challenges in biometric passport reform implementation. Albania was only finally granted visa-free Schengen access over a year later in December 2010. The Georgian government was likewise premature in its self-congratulation. It started issuing frequent positive statements about the purportedly ‘imminent’ visa liberalisation as early as autumn 2015. 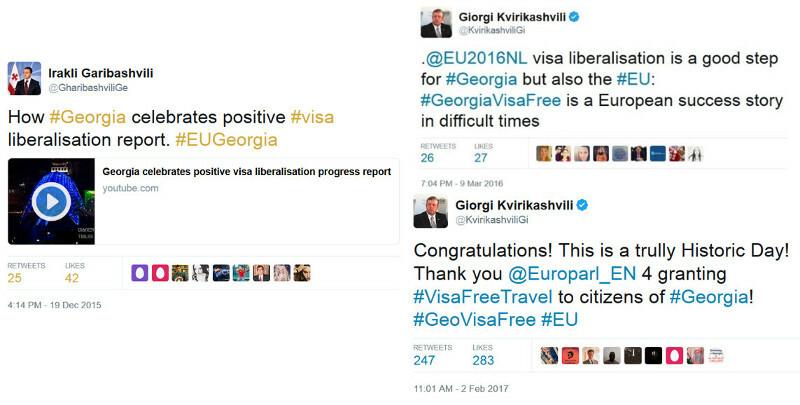 In December 2015, then Prime Minister Gharibashvili praised the fact that the EU had given its ‘consent’ for visa liberalisation, even though the process was far from complete. His government threw a massive party in central Tbilisi and lit up major landmarks in EU blue dotted with yellow stars in celebration of the liberalisation – not unlike the Albanian Government’s decision to decorate Tirana with Schengen Member State flags and ‘pa viza’ slogans in December 2010. In March 2016, Georgian Minister of Foreign Affairs, Mikheil Janelidze, claimed that Tbilisi ‘expected’ the visa liberalisation process to be concluded by June 2016. The celebrations continued throughout 2016 despite the fact the milestones were just steps of a multi-stage process involving numerous EU institutions and bodies. Even though the process has only now been concluded (on 28 March 2017) the news items and congratulatory announcements on social media now number in the hundreds, risking a certain ‘excitement fatigue’ among Georgians and the EU alike. Albania celebrated its final (actual) visa liberalisation in 2010, but the jubilant mood was soon soured by the re-emergence of accusations of abuse of freedom of movement by Albanian citizens. Inaction on the part of the Albanian government (e.g. a lack of awareness-raising on the nature of visa-free movement), eventually resulted in the EU revising its visa-free suspension measures. As Georgia’s travel and diaspora links with Schengen countries remain weaker than those of Albania (which has sizeable diasporas in Italy, Greece and other Schengen states), and awareness levels among Georgians seem to be even lower than in Albania, a lot of hard work lies ahead for the Georgian government to ensure that the visa liberalisation measures remain firmly in place after the initial liberalisation. Visa liberalisation is also widely seen in Georgia as part of the EU-Russia tug of war and it is likely to remain a contentious issue in both domestic and foreign policy. One might expect the conclusion of a visa-free deal to deliver electoral rewards to the ruling party. But Albania’s experience suggests it doesn’t always work out this way. Albania’s Democratic Party made visa liberalisation one of the central elements of its 2013 electoral campaign, and yet suffered a spectacular defeat at the hands of the opposition Socialist Party. In Georgia, the visa liberalisation process has already became a key part of the domestic political struggle, with the ruling Georgian Dream government accusing the opposition of sabotaging the process and the PM making false statements to the effect that Georgia was eligible to launch the liberalisation process together with Moldova. Although the next parliamentary elections in Georgia are over three years away, the government should not assume that its visa liberalisation success will be either remembered or recognised when Georgians next turn up to the ballot box. Georgia brands itself as a regional leader in reform and EU integration, sometimes at the expense of regional co-operation. But the fact is, events in other parts of the Eastern Partnership region remain important for Georgia. Although more adventurous ideas such as making Georgia the ‘Israel of the Caucasus’ or a ‘Caucasian Singapore’ seem to have left Georgian politics altogether with former President Mikheil Saakashvili, the will to move EU relations ahead with little regard for the progress of other Eastern Partnership countries remains strong. Just as Albania had visa liberalisation tied to Bosnia and Herzegovina (both countries were kept in the waiting room after Serbia, Montenegro and Macedonia were granted Schengen visa-free access), Georgia suddenly discovered its fate is linked to the performance of the Poroshenko administration in Ukraine. Angela Merkel’s remarks in 2016, suggesting that Georgia’s visa liberalisation could be tied to progress made by Ukraine, was vehemently protested by the Georgian government and yet remained an acute reminder of the importance of the regional context of EU relations. The Albanian Schengen visa-free access path shows that Georgia and other Eastern Partnership countries have a lot to learn from their Western Balkan neighbours. The EU integration experience of the 2004 A8 club (Czech Republic, Estonia, Hungary, Latvia, Lithuania, Poland, Slovakia and Slovenia) as well as Romania, Bulgaria and Croatia, differs sharply from that of Georgia in terms of integration and the international environment. This is clearly illustrated by the visa liberalisation process. What is more, the Georgian government (as well as other Eastern Partnership governments set on the path of EU integration) should be wary of raising hopes with regard to EU relations. Georgia has recently experienced the rise of populist parties, and creating unrealistic expectations towards the benefits of EU integration can backfire badly – both through bolstering domestic populism as well as a negative reaction from the EU. Max Fras is a Visiting Fellow at LSEE – Research on South Eastern Europe.